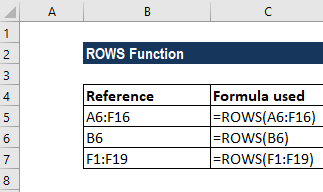 What is the ROWS Function? 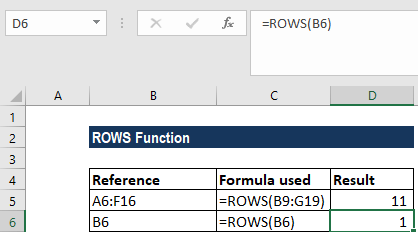 The ROWS Function is a Lookup/Reference functionFunctionsList of the most important Excel functions for financial analysts. This cheat sheet covers 100s of functions that are critical to know as an Excel analyst. The function is used to look up and provide the number of rows in each reference or array. 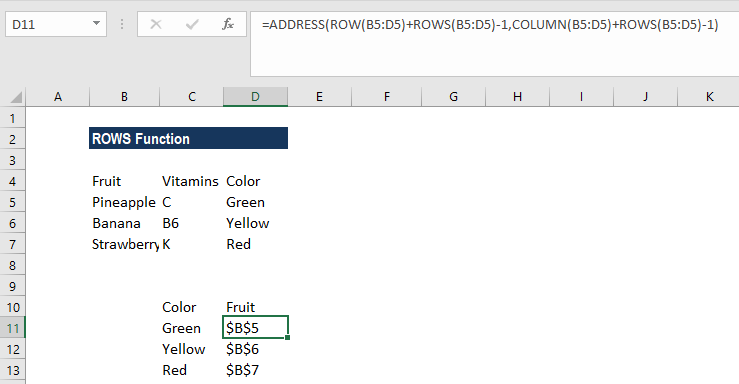 Thus, the function, after receiving an Excel range, will return the number of rows that are contained within that range. in financial analysisAnalysis of Financial StatementsHow to perform Analysis of Financial Statements. This guide will teach you to perform financial statement analysis of the income statement, balance sheet, and cash flow statement including margins, ratios, growth, liquiditiy, leverage, rates of return and profitability. See examples and step-by-step instruction, we can use ROWS if we wish to count the number of rows in a given range. Array (required argument) – It is the reference to a range of cells or array or array formula for which we want the number of rows. The function will give us a numerical value. 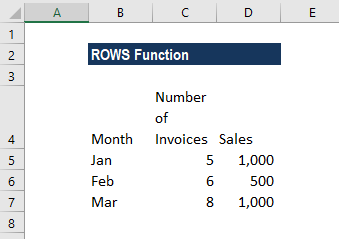 How to use the ROWS Function in Excel? ROWS is useful if we wish to find out the number of rows in a range. The most basic formula used is =ROWS(rng). The function counted the number of rows and returned a numerical value as the result. Lastly, when we provided the formula F1:F19, it counted the number of rows, which was 9, and returned the result accordingly. In the ROWS function, Array can be an array, an array formula, or a reference to a single contiguous group of cells. 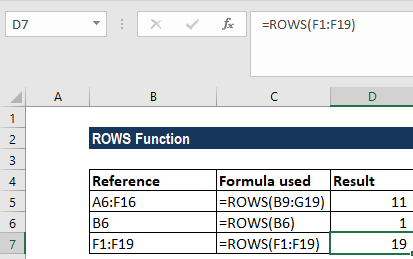 Using ROWS with other formulas. If we wish to get the address of the first cell in a named range, we can use the ADDRESS function together with the ROW and COLUMN functions. ADDRESS now collects and returns an array of addresses. If we enter the formula in a single cell, we just get the item from the array that is the address corresponding to the last cell in a range. The formula used was =MIN(ROW(B5:D7))+ROWS(B5:D7)-1. Using the formula above, we can get the last column that is in a range with a formula based on the ROW function. When we give a single cell as a reference, the ROW function will return the row number for that particular reference. However, when we give a range that contains multiple rows, the ROW function will return an array that contains all ROW numbers for the given range. If we wish to get only the first-row number, we can use the MIN function to extract just the first-row number, which will be the lowest number in the array. Once the first row is given, we can just add the total rows in the range and subtract 1 to get the last row number. For a very large number of ranges, we can use the INDEX function instead of the MIN function. The formula will be =ROW(INDEX(range,1,1))+ROWS(range)-1.